In conjunction with installation of the seismic monitoring system, we’ve also completed installation of a sophisticated groundwater monitoring system. There is a vertical mile of repeatedly-tested steel casing and cement that isolates fluid injected into or produced from the geothermal well from the groundwater. Our groundwater monitoring procedures will provide the proof that our groundwater protection measures are effective. The groundwater monitoring program plan will track local water resources before, during, and after the stimulation of the NWG 55-29 deep well, and involves taking water samples at strategic locations throughout the area. Groundwater samples will be collected prior to stimulation to establish background conditions, every week during stimulation (estimated to be 4 weeks), and then monthly or bimonthly for six months after stimulation. AltaRock staff will bottle the samples as well as measure physical conditions in the field, such as temperature, pH, conductivity, oxygen reduction potential, and turbidity. Sierra Environmental Monitoring, an independent laboratory, will conduct chemical analyses of the ground water we collect, measuring alkalinity, calcium, iron, and many other elements commonly found in hot and cold groundwater. In addition, a laboratory at the University of Utah will be analyzing for the non-toxic tracers injected into 55-29. Both labs will provide AltaRock with regular water chemistry analysis reports within 2 weeks of each sample that is taken. After Quality Assurance steps are taken, we will compare each sample with the background conditions taken up front. For a water quality change to be considered potentially significant, a deviation of 10% or more from the original concentration would need to be measures. If any such deviations are noted, AltaRock’s project manager will be notified immediately. We will launch a full assessment, and if that exploration indicates potential impact to groundwater or surface water conditions, the stimulation operations will be altered. In this case, these results will be conveyed to stakeholders as soon as possible. If no significant impacts to groundwater and surface water conditions are identified during or after stimulation, a final water monitoring data report will be prepared within four weeks of the last sampling session (to take place in Q4 2012). 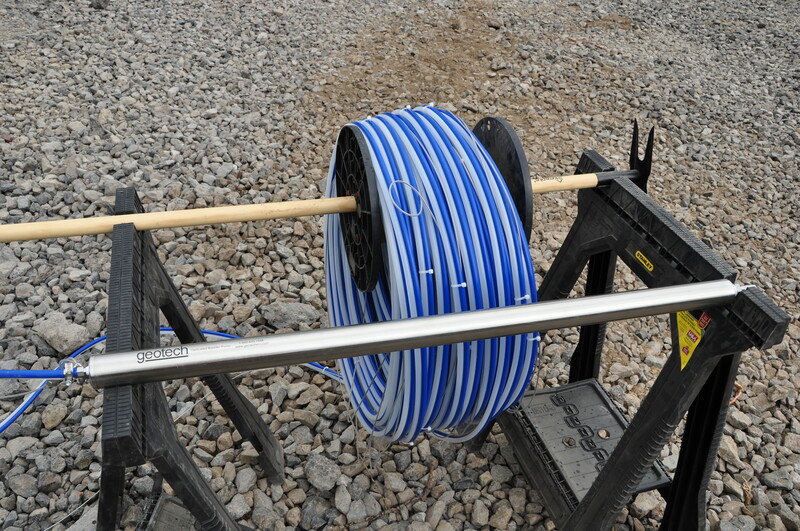 Tubing and downhole pump (silver cylinder) used to sample groundwater from 500 ft below the ground surface. 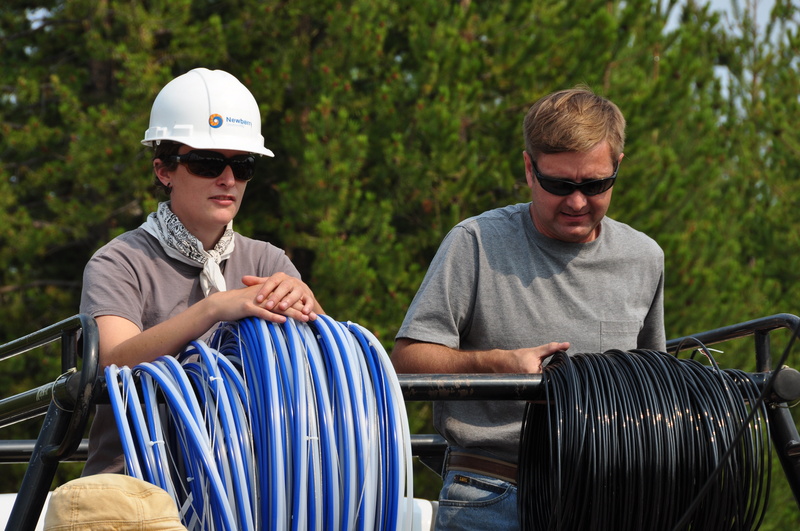 Kyla Grasso (left) and Ted De Rocher (right) of AltaRock, managing spools of tubing for pump and cable water level gauge. 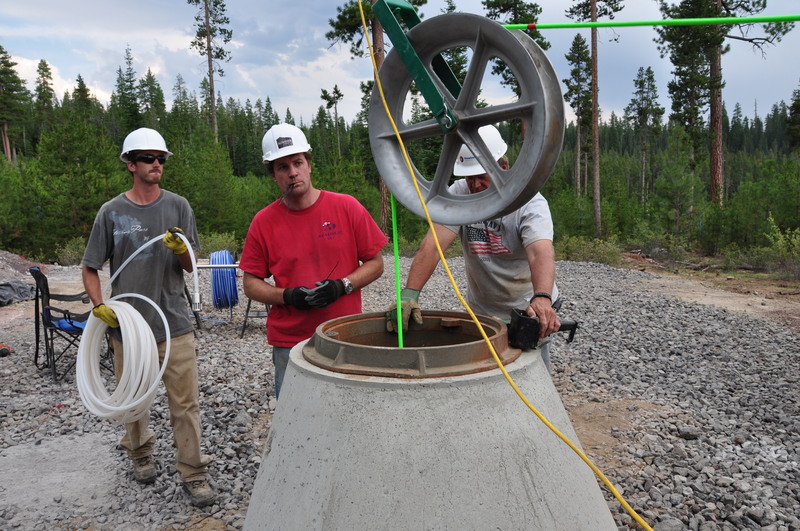 Tyler Cox (left) and Geoff Garrison (center) of AltaRock preparing to attach the water pump intake (white hose with filter) to the seismometer cable (bright green cable) as the seismometer is being lowered down.